Behold my will. It is strong like (undernourished) bull (that could stand to get to the gym a few days a week). But just because I don’t partake of the magic picture-and-sound crack in my home doesn’t mean I don’t keep abreast of the happenings in the video game console domain. For example, I’m familiar with the practice of creating “special editions” of blockbuster video games that sell for a premium price and include “extras” like additional content and artwork and felt gnome hats and whatever. But this is a bit much, no? The Call of Duty: Modern Warfare 2 Prestige Edition includes a bunch of inconsequential* stuff and then… a pair of night vision goggles. 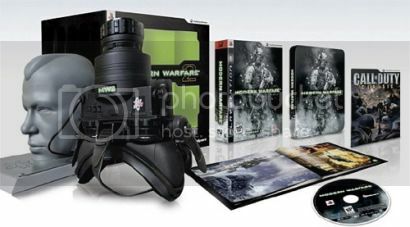 First, congratulations to those of you who have pre-ordered this package, effectively having spent $150 for the pleasure of owning a video game and what has to be the cheapest, fell-off-the-back-of-a-Soviet-army-truck-in-1987 joke of a pair of night vision goggles in the history of things that were made incredibly cheaply at the expense of actually working. Second, congratulations to the makers of Modern Warfare 2 Prestige Edition. I just checked the official national census statistics, and there is indeed a sucker born every minute. Every minute-and-a-half, if you want to get technical. * That’s right, gamers. I called it inconsequential. I can hear your scrotums tightening in anger from way over here. Well, screw you for making me think about your scrotums. Damn you, GWS, at first I thought this was a bonus geek giveaway for this week! There’s a lot of crunching noises coming from behind our backyard fence at night. These goggles would have been handy to confirm if the sounds are zombie-killer ninjas as I suspect, or just deer or other varmints. My magic picture-and-sound crack addict husband agrees with you. You are forgetting that half of the fan base for that game hasnt had their balls drop yet so they wouldnt understand your scrotum comment.